The Delta College Track & Field team recently held the Mustang Invitational Heptathlon/Decathlon event April 3-4, on campus at the Lawrence DeRicco Track. This two-day event included Track & Field runners from Chico State, Humboldt State, Modesto Junior College and a number of runners with no school affiliation. On the first day of the event, Track & Field spectators had the chance of witnessing athletes take part in the 100-yard dash, long jump, shot-put, high Jump and 400m. The second day, the competitions consisted of the 110 hurdles, discus, pole vault, javelin throw and 1500-meter. For athletes who participate in the Decathlon event they must be involved in all 10 events, as opposed to single event runners. “The Decathlon is what I train for and I’ve been really improving a lot,” said sophomore Travis Turner. 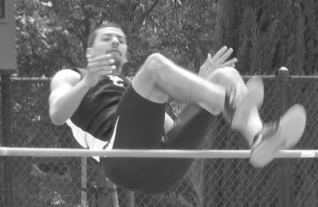 Competing in a Heptathlon/Decathlon event can be challenging and requires hours of training. The Mustangs train for 4-5 hours on the track M-W-F and take part in weight training for 2-3 hours on Tuesday & Thursday. By training for multiple hours, five days a week, the Mustangs have an opportunity to correct any noticeable mistakes in form and performance before the team’s next competition. “I’m usually on the track for about four hours, working on my jumps and hurdles,” said freshman Dewayne Lee. Members of Delta’s Track & Field team, value the advice given to them from the coaching staff, as these athletes move forward during the season. “I don’t believe I’ve done as much work on my technique as I’ve done since working with Coach Bond… He’s the most fundamental coach I know,” Lee added. Long/Triple Jump Coach Lester Bond is someone that has a lot of experience and knowledge to share with members of Track & Field team. As a member of the San Jose State Track & Field team from 1961-1965, he became the first African-American Captain of a SJS Track & Field team. In 1964 Coach Lester Bond was selected to the same year was selected to compete in the Long/Triple Jump USA Olympic Trials competition. If there’s anyone that can prepare Track & Field athletes for a long enduring season full of aches and pains, it’s this guy. “In order to execute an effective Long Jump is believing you have the will to do it,” said Long/Triple Jump Coach Lest Bond. “It requires the most muscle effort of all the event,” he added.